Freshman forward Addie Steiner put the nail in the coffin during Northwestern’s 2-0 victory over Minnesota. 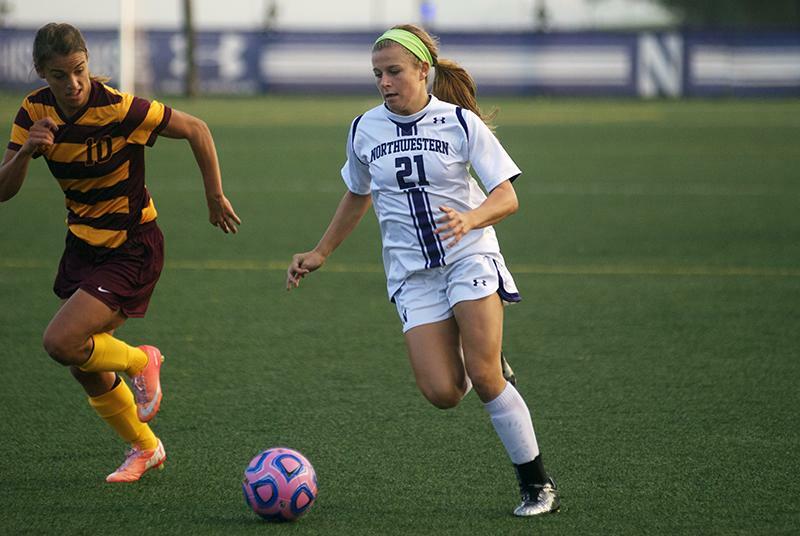 She buried the Wildcats’ second goal in the net, sealing NU’s first Big Ten win. It was her first career goal. The Wildcats snapped the Golden Gophers’ three-match unbeaten streak with a gritty defensive performance and goals on either side of the break to earn themselves a valuable win at home Saturday. Northwestern (3-9-2, 1-5-0 Big Ten) defeated Minnesota (9-4-1, 2-3-1 Big Ten) for its first conference win of the season after a week of close games and tough losses. The Cats outshot the Golden Gophers 19-6, with nine shots on goal in a dominating performance. The first goal was scored by junior forward Katie Landgrebe toward the end of the first half. Freshman forward Addie Steiner notched the first goal of her career in the 80th minute to close out the game. The two teams exchanged spells of possession throughout the first half. Although Minnesota could not find an offensive rhythm, NU picked up the pace. The Cats forced the Golden Gophers’ goalkeeper Tarah Hobbs into five saves before Landgrebe scored low into the bottom right corner of the goal after a perfectly threaded pass from senior forward Kate Allen. It was the Golden Gophers, however, who started out the brighter of the two teams in the second half. After the referee blew the whistle, Minnesota forced a couple of corners early on in the period. In the 54th minute, freshman goalkeeper Jenna Hascher made a brilliant double save after sustained pressure from the Golden Gophers. Following Minnesota’s early second-half attacks, the Cats regained control of the game. In the 63rd minute of the match, a shot by Allen rattled the Golden Gophers’ post. The only caution of the game also occurred during this time, with Minnesota’s forward Haley Helverson picking up a yellow card in the 71st minute. On a counterattack in the 80th minute, Allen gave another great pass — this time a header — to Steiner, who shot low and to the left of the keeper for the second goal of the game. The score also marked Allen’s second assist of the game. “It was nice that Addie was able to tuck away that breakaway at the end to clinch it for us,” Moynihan said. Steiner, who is tied for second in shots taken this season, scored her first career goal against Minnesota. Moynihan agreed it was about time. “For her to get that goal gives her some confidence and a little bit of reward for all the hard work she’s been putting in,” Moynihan said. From that point on, the Cats held on to break their losing streak and pick up an important conference win. But NU does not intend to rest on its laurels. “We have to take it one game at a time,” Landgrebe said.